CASA of Williamson County, a non-profit organization, and member of the National and Illinois CASA Associates, advocates for the best interest of abused and neglected children. Based on the belief that children are entitled to a safe and permanent home, CASA works in collaboration with legal counsel and community resources to serve as the child's advocate and represent the child in juvenile court. Court Appointed Special Advocates of Williamson County is comprised of dedicated volunteers, trained to assist our children in need. As a result of our volunteers, extremely vulnerable children and youth are supported by our caring and committed advocates, providing reassurance and stability through the sea of case workers, attorneys, therapists and care givers. CASA volunteers are ordinary men and women who want to personally lend a hand to our children in need. Along with our director, they work with a judge, alongside attorneys and social workers, as appointed officers of the court. When a CASA is assigned to a case, it is his/her responsibility to learn as much as possible about the involved child(ren) by reviewing records, visiting teachers, neighbors and parents. Helping to determine what is in the best interest of the child, these volunteers then appear in court to report their findings to the judge. Our Children Need YOU ! There are abused and neglected children in Williamson County who need your support. CASA of Williamson County, Inc., is only a phone call away. Become a volunteer, make a contribution or simply tell others about how CASA is helping children through frightening and bewildering times. Nationwide, on any given day, there are approximately 400,000 children in out-of-home care. During the last year about 640,000 children spent some time in out-of-home care in the US. Illinois Department of Children and Family Services reported in the 13-14 fiscal year there was an increase of 36.1% of indicated reports of abuse and neglect. This means over 26,700 of our children were victims of abuse and/or neglect with over 14,800 of these children spending time in foster care. Tragically, 103 children in Illinois died from abuse or neglect, which is 19 more than the prior reporting period. Approximately 2,430 CASA volunteers contributed over 118,900 volunteer hours. 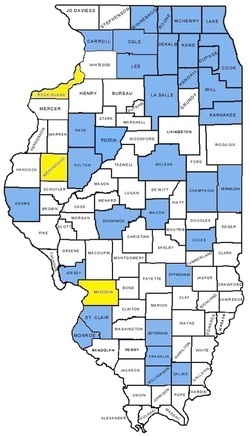 Out of 102 Illinois counties, only 36 have CASA services available. Only 38% of the children needing an advocate in Illinois are appointed one. Illinois is one of seven states that do not fund their CASA programs with tax-based dollars. Each Illinois CASA must generate their own funding. CASA of Williamson County served 169 children in 2014, 67 of whom were new to CASA. We have over 70 active CASA volunteer advocates. CASA Advocates have been assigned to 100% of the abuse/neglect cases that came into the court since October 2007. Per DCFS website, Williamson County had the highest number of indicated reports per capita in 2009. CASA OF WILLIAMSON COUNTY NEEDS YOU TO MAKE A DIFFERENCE FOR OUR CHILDREN! !